If there was ONE habit that would change us from the inside out, it would be spending time in God’s Word every day. I didn’t always do this. Throughout my college years and my early mom years, I was a hit-and-miss daily devotional girl. When I was in a group Bible study, I got into the Word regularly but there would often be dry spells in between. It wasn’t until I wanted my kids to have Bible time that I began to really prioritize our time in Word every day. And it wasn’t until I desperately needed God to even get through my day that I prioritized it at all cost. Without a doubt, that we will be different people this time next year if we’ll spend time in God’s Word every day. Because God’s Word is living and active. God speaks to us through His Word. He may use a passage to convict of an attitude or habit or sin that we need to change. He may use a scripture to remind of us who He is — His power and holiness and patience. God may use a verse to remind us of His promises. God’s Word challenges us, lifts our head and – best of all — reminds us of Who He is and what He does. So ask yourself: who will you be this time next year? When this year is wrapping up and you’re just about to turn the calendar to the next, what do you most want to change? Here’s a story about the impact of daily time in the Bible. A first-century rabbi sitting beside a stream noticed a great hole in the rock below. Looking up, he noticed a small drip. Year after year after year, the steady drip had carved out the great hole in the rock. See the impact was made not through a sudden rush of water but from a small, persistent drip. That same principle applies to our Bible reading. The daily drip of God’s living Word on us and in us makes a huge impact over time. Habits will change, emotions will stabilize, hearts will fill, questions will be answered, souls transformed, strongholds defeated and truth known. Here are my favorite tools for Bible journaling. The Journal the Word Bible from Thomas Nelson is my favorite journaling Bible. This Bible has wide, lined margins with pages thick enough to hand-letter or illustrate your favorite verses. There are several options including cloth or hard-back covers in King James and New King James versions. Use archival quality pens that won’t bleed through or fade over time. I use these Sakura micron pens for precise color and no bleeding. They are my favorite! Colored pencils are a great way to color and shade your illustrations as are Crayola twistables. 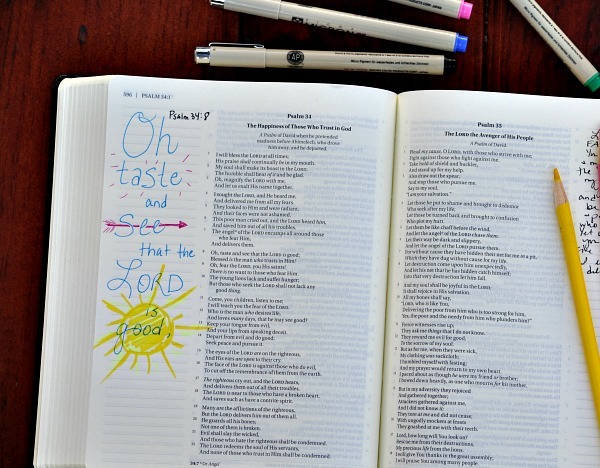 Neither colored pencils nor Crayola twistables will bleed through the pages of your journaling Bible. These Bible journaling supplies will get you started but if you want to really doll up the pages of your Bible, Dayspring’s Illustrated Faith has a great line of themed units. The Illustrated Faith materials include special paints, custom stickers, themed washi tape and other supplies for a full Bible journaling experience. You do not have to be an accomplished artist to start Bible journaling! You can download my free 100 Days with Christ Bible study to read chronologically through all 4 gospels. *This post contains affiliate links, never at any additional cost to you. I’d love to have one of these. I’ve been wanting one for awhile. A beautiful challenge for the year ahead! Thank you!! Would love to be able to journal in my Bible. I have a standard KJV Bible that does not have wide margins. I love the things you put out on email. Beautiful calligraphy. God bless you and whoever wins. I desperately need to do this!! Lisa, I can’t wait to start this journey. I printed off “100 days with Christ” and repurposed my sons binder from school. I hope you had a blessed Christmas and thank you for being such a blessing to others. Happy New Year! Yes and amen! Thank you, Lisa, for the chance to win such a treasure!!! I’m looking forward to joining your 100 days with Christ study, Lisa. Would love to journal along in the Bible. Thank you for leading. I have started a personal journal since my husband died two months ago. It has helped, but I think this would be a wonderful addition as I can relate the scripture. I am sorry Janet for the loss of your husband. I understand the journey you are on. My husband also passed away in October unexpectedly. My pastor told me that day that the kids and I were about to experience God’s grace in a whole new way….and he was right. In my toughest moments I know He is carrying me. God has also shown me the moments that I can rejoice. Being our first Christmas without my husband I was not sure how we would feel. God’s grace came upon me during my devotion time on Christmas Eve. “Holy, Holy, Holy” That’s what I heard. Looking it up in my Bible I came to John and Isaiah getting a glimpse of heaven. The angels in both texts were singing “Holy, Holy, Holy is the Lord Almighty” Immediately I desired to rejoice with the angels, and then it hit me. My husband is rejoicing with the angels. Joy filled my heart and carried me through Christmas day. Even apart I felt a close bond with my husband knowing he was rejoicing with Jesus on His birthday. The wonderful thing is that I was able to share this with my two teenage kids and that made Christmas easier for them. I am sharing this with you in hopes that you will be encouraged and that you realize God’s amazing grace in a deep personal way. May God’ love, peace, hope and joy comfort and build you up in the coming year. I want to give myself to God completely. I want to learn how trust good completely and not depend on man. I feel this journal can help me to become the Christian I am suppose to be. I’m started in June and totally love it! It’s a whole new understanding when you read it chronologically! You’re going to love it and learn so much!! I am so eager to get closer to God in 2017 and focus on my walk with Christ and not try and change my spouse and child but focus on what I can do with the power of rhe Holy Spirit to change me and how I react to things I have no control over. What an excellent way, and time, to start a Bible study. I too have been lax in my daily Bible study habits – in fact most of the time I don’t. But I WANT to. Thank you for this study beginning, and thank you for the Bible give-away. The right tools make any undertaking easier! A daily struggle for me to study and journal. Having a place for both to reference back to would be wonderful! I just received a Journaling bible for Christmas from my husband! I cannot wait to get started using it! I hope someone who really needs and wants one of these bibles gets it! Thankeep you for your encouragement and blogs! I would love to win one. I’ve been wanting to start Bible journaling, husband says I don’t need another Bible though. If I win one I will be giving all the ones I have away. Hello.. I have decided that I’m not going to wait until 2017 to start making God A priority in my life 2016 has been such a tuff year for me and I refuse to go into 2017 the same way.. I am getting out of the drivers seat and letting Jesus take the wheel.. Cause I know he already knows the way. Growing in Christlikeness is so important for us as believers. I want the Lord to grow in me a “gentle spirit” as described in Philippians 4:5 AMP (graciousness, unselfishness, mercy, tolerance and patience). I need more of each of these in my life as I respond to others and to the struggles of life. Thank you so much for your encouragement! May the Lord refresh your soul as you study His Word. Sweet blessings to you! I look forward to doing the study and would love the opportunity to win one of the Journal the Word Bibles. Thank you for the chance to win! This Bible is already on my wish list. I love reading your writing and seeing how the Lord is working in your life. Thank you for being so transparent! I am very excited to start your 100 Days with Christ Bible Journaling study. I have tried to faithfully read the Bible cover to cover many times by myself and always end up slacking off. I know sticking with your study will help me stay on track. Thank you so much for doing this. I can’t wait to begin I am super excited. Thank you for this challenge!! Don’t think I’ve ever seen a journaling Bible!!! Bless you!!! I have been looking for a bible study that will also let me be creative. This is perfect! I cant wait to start. I also invited my mom to study with me. I desperately need a closer walk with the Lord. I use to hear God speak to me daily and I strayed. I have not been able to forgive myself and I find it hard to believe God can forgive me although I really know different. I praying that with daily bible study and journaling God will speak to me again. Please remember me in your prayers. I’d love one of these beautiful Bibles! I’ve been using a Bible app for a while, and while it is convenient, I miss writing in the margins and looking back at my notes from long ago. A journaling Biblevepuld help me so much! I just started reading the Bible for the first time. I am at a point in my life when I need God to be a part of my daily life and not just here and there. Being able to participate in your Bible study will help me to learn what it is God has planned for me and to get closer to Him. I think this will be a great way to dig deeper and cultivate my relationship with the Lord. This would be a wonderful and exciting way to get into The Word. What a wonderful giveaway!! Pray everyone has a blessed New Year!! This would be a wonderful and exciting way to get into The Word. What a wonderful giveaway!! I pray everyone has a blessed New Year!! Oh, I would just love one of these bibles just as college is starting up, and my job as a girls’ youth leader is taking place! Looking forward to the New Year with a new Bible Study, New devotional challenges, New ways to “taste and see that the Lord is good!!!! Happy New Year to everyone!!!! Jan.1 is a great opportunity to rededicate time and self to God!!!! AMEN!!! I look forward to the 100 days Bible study. Thank you. Very excited about this 100 Days Study! Thank you for hosting it! On a journey to grow closer to God and follow his will. Excited about taking that first step to start Bible journaling. Would be very excited to receive on of these! Thank you for this opportunity! Excited to start 100 Days with you. I have been wanting one of these Bibles for a long time. I have just begun digging deeper into God’s word. What a treasure for whoever is blessed with these Bibles. Thank you Lisa for the opportunity. This would be an excellent gift to own. Thank you. I have been eyeing this Bible! What a lovely giveaway! My word for 2017 is GROW. Journaling would be the grow and be more like Christ at the years end. I can not wait to start the 100 days Bible study. Thank you for offering us the chance to receive a journaling Bible. I’m just starting to journal.Would love to try this. Have tried Journaling with little success. Looking forward to seeing how this works for me. Would love a Journaling Bible. Yes, more like Jesus in 2017. Thanks for your words of encouragement! 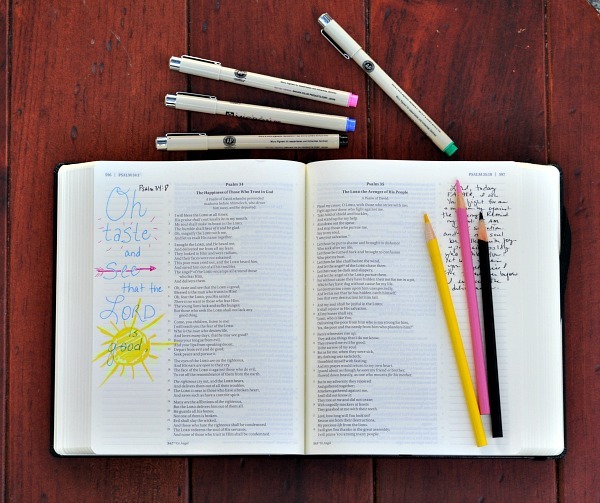 I would love a journaling bible! Thank you for your blogs and inspiration! Thanks for the reminder. I pray that I will change too. What a great way to start 2017! Thanks for the inspiration and motivation. Love this friend. Thanks for the tips on the colored pens. You are God’s blessing. I’ve printed off the 100 days with Christ study and cannot wait to start on January 1. I started late last year but I truly want to get in the word more and learn and grow deeper. I would love a copy of this Bible to help me on this journey. May God bless you in this ministry and all who join in. Thank you for the encouraging post. I have had a journling bible on my wish list for awhile. Thank you for the opportunity to win one! What a blessing for whoever wins. Your message was timely. Being in God’s word consistently was not an easy habit for me. Looking forward to getting into the gospels and journaling in my bible. My bible now is full of sticky posts and loose papers. This would be an awesome gift! Can’t wait to start 100 days of study with you. Thank you for always being open & encouraging. I’m excited to begin the 100 Days with Christ study and would greatly enjoy the Journal the Word Bible! You are such blessing to me! Sound the 100 days with my daughters!! Can’t wait!! I am looking forward to the 100 Days with Christ study. I was looking at a Bible like this at a local Christian Bookstore and thought about getting one like this. I’ve wanted to start Bible Journaling but didn’t know how. Thank you for the opportunity to win. Would love to have this. Thank you for the opportunity!! I would be so delighted to win one. I’d love to have one of these Bibles. I am looking forward to the 100 days of study and would love one of these Bibles to start fresh in the new year of studying God’s word. Thanks for sharing! Would enjoy one of those Bibles. I would surely love to have the Journal Bible. Am expectantly looking forward to the 100 days with Christ Journal & study, cant wait to start! I have never done a Bible study–we Catholics don’t know our Bible. But I am going to follow you. I admire your devotion and belief in a good God. You truly have touched my life. Thank you! I have received so much encouragement from your blog! God has brought you thru the valleys and your testimony is an inspiration! I know it wasn’t my fault that I needed surgery and it only made my pain 100 times worse. I have felt so much encouragement from your site as well as a few others. I learned a lot of things from your site that has enabled me to get more out of studying the Bible. Even if I don’t win a new Bible, I still want to thank you and the comments posted by other readers. God bless you! This is so great, thank you for doing a giveaway that could change someone’s life. You’re awesome! Journal the Word Bible, YES! Thank you. hope to have in my home and in my hands. Blessings to you.t. 2016 was our (my daughter & I) year of firsts adjusting to our new life since my husband of 42 years (her dad of 30 years) passed away unexpectedly….’we would have despaired unless we had believed to see the goodness of the Lord in the land of the living’. His Word has brought us through each moment of each difficult day. We had to close our family business of 30 years, family relationships fell apart, helping my mom with Alzheimer’s has been hard, looking for a home to live in as we had sold our home one month prior to his passing to downsize & simplify life for our latter years (we had been in a rental for 1 month) … the word the Lord gave my daughter for us for 2017 is HOPE…we WILL obtain & attain this as we grow deeper in relationship with Him. Thank you for your devo’! How awesome and exciting to begin this journey. Thank you for your ministry! Thank you for the reminder to remain diligent in the Word daily. In the “busyness” of life, it’s easy to forget. I would love one of these journaling bibles! Thank you for your encouragement! I didn’t know there was a journaling Bible! I can’t wait to get one for myself and all my girls! I have been wanting to try this for some time!! Would love to win! The daily discipline of journaling was already my plan for the new year. It is not about how one engages with scripture but that one does engage regularly. I have been looking at these often, really wanting to purchase one. I would love to receive this Journal Bible! Thank you for your servant’s heart and loving the Lord enough to share what He has spoken to you! What a wonderful way to fully absorb the Word of our Lord. Blessings to your for 2017! A New Year and a renewed commitment to the One who longs to spend time with me. I want to remember daily that God wants me to “simply come just as I am” and meet with him, making my time and my relationship with Him my top priority. What a treasure these will be -the promises of God memorialized in such a personal way. 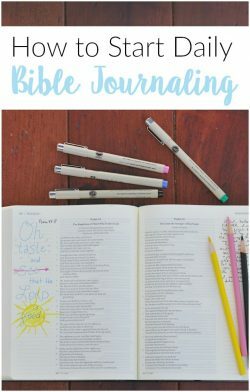 I have been seeing so much about bible journaling, but I have not attempted it. I would love to start. This is an awesome giveaway! God Bless you & your ministry! Would absolutely love to start a Bible journal and your Bible journal would be wonderful to use for it. I would LOVE this. I’ve been using the same Bible for nearly 30 years, which I love. But, I’ve been wanting/needing to get one that has more room to take notes and journal in. Thank you for giving away 2 journaling bibles. I will be signing up for the study and sharing with a sweet friend about your study as well. Thank you for sharing the LORD with others. I have been writing and using colored pencils to color in my bible since I was 19. People thought I was crazy! They still do. But I have found a lovely group of women who do it too. I invited one of my longtime friends who mived back into town. She’s hooked! It took her into a deeper level of healing by creating and delving deeper into Christ and His word. It still does the same for me. Now there’s fabulous people like you making it public. Love it. And thank YOU! What a great gift you are giving away. I have my mom’s bible from when she was in Bible School in the 1950s and she has notes all over the tiny margins. I guess she was Bible journaling before it became a big thing. Love to look at it and read her notes. Would love to start my own. Whether or not I win a Bible, I’m looking forward to your leadership, to learning, and to becoming closer to the Lord. I normally do not write in my bibles but I would love to have a bible to look back on and see where I was at that time in my life. My husband said he would do the bible study with me. I pulled up the 100 Days with Christ bible study journal that I had printed last year. I have been looking for something to start the new year and this is it. Thank you for the encouragement. I look forward to what God has to say to me this year and how He will change me throughout 2017. Thank you Lisa for your faithfulness to Him and His word and for challenging others. I have really been wanting a Journaling Bible! I’d like to create one for my kids and grandkids to gain faith from. I love this! I had already printed off the 100 Days journal and reading and am SUPER pumped! We actually have a “quiet time” series launching on our blog the first week of Jan haha so this goes hand in hand with that. Always love your words and encouragement, Lisa! As a child, I was admonished for writing/drawing in my (or anyone else’s) bible. I am extremely nervous about journaling in God’s Word – but a nervouseness I am willing to face head on! 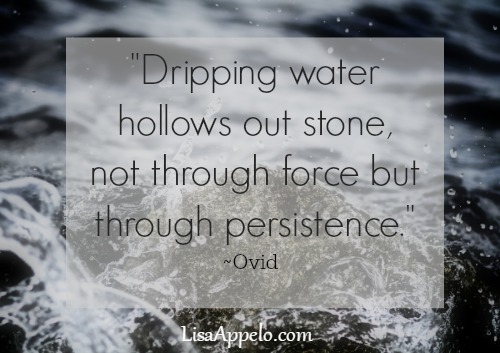 Lisa, what a fantastic lesson about persistence in Gods Word. I am looking forward to this study! I wouls love to be able to have one of these journals. I am an avid reader and writer and just began trying to focus on God’s word and implement it into my life. I am doing the 2017 Bible Challenge with my church and would love to have the journal to document my progress along the way. Thank you for helping people like me through their journey. This Bible would mean so much to me. I have been journaling, underlining and writing my own journals for years now, and I didn’t even know about this beautiful tool. My King James Bible is well worn, and I have only made a dent in it after all of these years. I love to underline and write thoughts from what I have just read. I am 75 years young, loving God and my Savior all of my life, but it has been difficult to continue my journaling some days due to a little depression from being estranged from my grown children and grandbabies for almost 4 years. We had to move away to a new state and new life to survive, and some days are hard, but I hope to continue journaling and looking into getting this beautiful bible next time I can purchase one some day. God’s blessings to you as I read your articles, and they lift my spirits, knowing you have such strength. Stay strong and blessings to those 2 lucky people who get these gifts. I would love to win a journaling Bible. I’m so looking forward to 2017 and beginning the 100 days Bible study. I became a widow in late 2015 and finally feel like life is starting to come back into focus. Praying for God’s direction in decisions in the coming year. Lisa thank you for the encouraging words you share. God Bless! I’m so excited to see what God has in store for me this year! Trying to get into the habit of reading/ studying the Word. Looking forward to start the study. Thank you for the chance to win 1 of two NKJV journal the word bible. God bless you and your family. My friend and I just made plans today to be accountable to each other in bible journaling this year as a way to get closer to God as we both recover from the loss of loved ones. This will be a great way to begin. I’m barely beginning my walk with God and I’m very excited!! Thank you, Lisa for taking your time to share your journey with Christ. My best friend’s husband died a year ago and many things you have shared has helped me to listen and minister to her. I try to “fix” things and you have taught me that many times she just needs a friend to listen and be there for her. Thank you! I have just got a “Color the Psalms” weekly planner and I would love the Journal Bible to study and journal along with you. I pray that you and your precious family have a wonderful New Year. My name is Alice, I have been away from God for some time. I downloaded the Bible Study and am truly looking forward to starting with you January 1st. I would also love to win one of the two journaling bibles. I am an avid journaler. Thank you for putting this course and give away together. What a perfect encouragement to get in the Word daily. I have seen several other posts about Bible journaling, but I love how this is in the Bible itself and as the pages are reopened, it reminds you of how the Lord spoke directly to you. Would love to have one to do this. I have signed up for your 100 days Bible Study and am excited to begin! It seems to be just what I need right now to start the new year off right! I would love to have a journaling Bible too! 🙂 Thank you for offering this giveaway! I am excited to start this journey of journaling! What a wonderful blessing, the best way to begin a new year, new life! God’s renewal! I would love this and I would share it with someone I love, like a daughter who’s never had a Bible and she wants to journal one so badly. Thank you and Happy New Year! What a wonderful start to my new year. Lisa, you are an inspiration to people all over the world. Thank you for your generous offer. I would love to receive a journaling Bible but I know that who you chose will be God’s choice also. God bless you. My goal this year is to spend more time learning and practicing God’s word consistently. I look forward to joining you for 100 days. With 3 kids and a sporadic Bible Study group I want to take more control over my time and the best way to spend my time is with God. Lisa, this is my first time connecting with an online Bible study. I’m excited to walk on this journey with you and others to trod the path of the Lord’s journey through the gospels. Thank you for your offer. I’m thankful that i found your site through Pinterest and the Lord’s prompting to join. Blessings. I’m excited to start the year off right with a study of Jesus, my Savior! 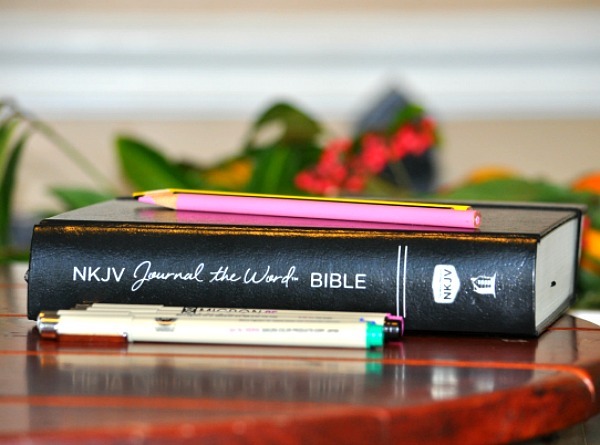 I have wanted a Journaling Bible for a very long time so would love to win one of these! What a wonderful gift. I would love to win it. I’m a little late jumping on board here, but just a few tips from this Bible journaling newbie😉. Amazon had some awesome deals on journaling Bibles. I actually got 2 for under $50. I got one to get creative in during my devotion time and one to take to church for sermon notes. I also have a Bible I’ve written in for several years…now I will have 3 so each of my kids will one day have one to see “mom and God’s” time together. Also…gel pens are great in addition to the pigma pens. They are inexpensive and don’t bleed thru the pages either. Amazon has sets of like 120 colors for around $20. Can’t wait to get started and catch up with your study. God bless!